*I received a physical ARC in exchange of an honest review. A story drenched in the country music scene, outlining one girl's inner issues as well as her personal growth in starting a new. 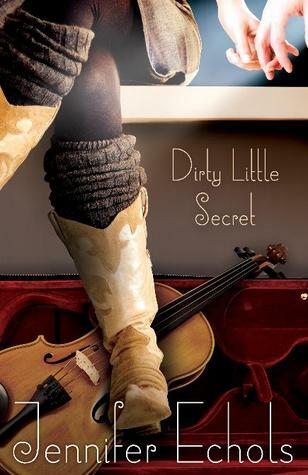 Dirty Little Secret is musically captivating but consists of mildly intriguing characters. I started reading this book a few days before its release and would've finished had it not been for the opening chapters. I don't know why-scratch that, I do. Bailey just came off as a miserable teenager overly bitter about her sister getting a recording contract and her family (mother in particular) throwing her under the bus. I get why she's upset, her family is despicable for coming up with such terms and blocking Bailey from pursuing music. But come on, I feel like if she really was passionate about it and wasn't so busy feeling self-pity, Bailey would've chased after her dreams, shitting on what her parents said. Her character didn't pull me in that much. Meaning, I felt no connection, but that doesn't mean I disliked her. And truth be told, I developed no connection with any of the characters in the book but I still read on being that the story was interesting. Sam turned me off completely. His comments at time were amusing, but I just couldn't feel the attraction between him and Bailey when he was such a prick and she seemed too naive with him. However, the one thing I liked was that he got her into playing with the band and actually made her open up about her problems. Though, he was far too ambitious (like her mother, maybe that justifies the attraction on her part, like a cycle), and he wanted badly for his band to make it in music no matter what, not a bad thing but he should fall back a bit and breathe. I also would've loved to have Bailey's parents more in the story as well her sister, Julie. I know they were pretty much busy touring and such but it would have been interesting with the mother especially because I'd like to hear some of the things she'd say about Bailey pursuing music against her threats. Towards the end, they warmed up about the whole thing and that to me was kind of fast as well. But I guess Jennifer wanted to give us a nice ending with everyone getting along. The biggest highlight for me was the element the plot surrounded. I absolutely love music so it's always great to read stories where music is infused in the story and the author did just that. From the musical notes to ranges described, it sounded like everybody knew what they were talking about and I was impressed with that aspect in particular. Overall, Dirty Little Secret was a good read with a few minor issues here and there. This is my first time reading a Jennifer Echols novel and I'm pleased with the writing. Details were substantial and not overbearing, and the plot itself was fresh and far away from what I've been reading lately in New Adult. So, yes. I will be reading much more by the author. Great review, Shane! You summed up all the issues I had with the book that I just couldn't think of how to say them. I kind of felt like the ending was sort of the easy way out? I don't think I would've warmed up to Sam that fast, nor would I have gotten along with my parents after all the crap they put her through. But overall, I thought it was a nice story. Yep, the story was good just oddities here and about. I guess I may not have enjoyed the story as much if Bailey and Sam weren't flawed characters. Wonderful review, Shane! I have never heard of this book before, so thanks for sharing! It's a pity you didn't feel much toward any of the characters or that the relationship between Bailey and Sam didn't feel solid enough and was a bit questionable... I'm glad you liked it enough that you're going to try Echols other books though! I'm particularly interested in her book, Such a Rush as this one doesn't really look like my cup of tea. Yea, I've heard far better feedback about Such a Rush so I would like to give that a chance. I had really high hopes for this. I have it, but haven't had a chance to get to it yet. I read another review today where the reviewer felt very similar to the way you did about the book. Thanks for sharing. We has some of the same issues with this. Bailey, was miserable and Sam was so manipulative, I just didn't like him. I love the music parts though. Great review.